Potter County farmers have by and large been doing their part to cut the amount of contaminants running off agricultural land into the Chesapeake Bay watershed, signaling a historic shift in a decades-long trend that has fouled that important estuary. Potter County Conservation District (PCCD) has been a key player. “Most of our local farms are complying with the state’s requirements, but many don’t have formal plans in place yet,” PCCD manager Jason Childs said. “The majority are willing to work with us to help develop those plans.” The handful that have not responded to PCCD’s notifications will be referred to the Pa. Dept. of Environmental Protection (DEP) for further communication aimed toward compliance. New measurement tools are being used to verify county-by-county reductions in agricultural nitrogen and phosphorus entering the Chesapeake Bay watershed. Some 44 Potter County farms have been inspected since last November. Another 50 inspections are planned before next spring. Casey Boyer, who recently joined PCCD as agricultural conservation/Chesapeake Bay technician, is performing the inspections. “Our goal is to maintain a technical assistance role as much as possible, and to discuss potential projects the farmers could tackle to reduce run-off,” Childs said. PCCD can help local producers apply for grants, construct best management practices, and document measures that have already been completed to protect natural resources. 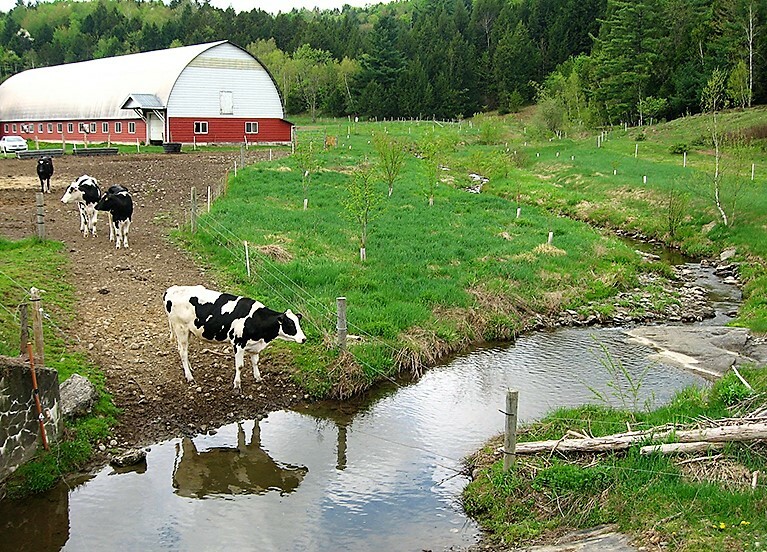 These range from installation of roof gutters, vegetated buffers and no-till zones, to rotational grazing systems and streambank fencing. Jim Ladlee discussed the challenges Penn State University faces when “absolutists” expect it to become an advocacy organization rather than a trusted information source. Members of the Potter County Natural Gas Resource Center Steering Committee recently met to plot the organization’s activities in the coming months and years. Leading the session were coordinators Will Hunt (Planning Director) and Jennifer Rossman (Community Development Director). Also attending were members Terry Cole (Pa. CareerLink); Al Haney (Gas Field Specialists Inc.); Charlie Tuttle (Triple Divide Watershed Coalition); Commissioners Susan Kefover, Doug Morley and Paul Heimel; Jason Childs (Potter Co. Conservation District/Water Quality Work Group); and Helene Nawrocki (Potter County Education Council). Guest speaker was Jim Ladlee, Penn State Extension, Assistant Director of Energy, Entrepreneurship, Economic and Community Development Programs, who is also affiliated with the PSU Marcellus Center for Outreach and Research (MCOR). Tony Siliano and Melissa Sankey, regional administrators for Penn State Extension, also attended. Roughly 50 percent of Potter County’s 684,000 acres contain shale gas that could be subject to drilling. That does not mean it will be developed. Too many uncertainties exist to forecast the extent of development. Returns on the Marcellus Shale production (3.34 billion cubic feet produced at last report) show that it may be “marginal” in terms of the industry’s desired return on investment. However, early forays into the deeper Utica Shale gas (4 producing wells reported) suggest that the resource is more bountiful. Ladlee cautioned that there’s not enough data available today to reach any firm conclusions on the Utica Shale’s potential. Production of shale gas will likely be a long-term phenomenon, whether it’s used as a “bridge” between fossil fuels and a renewal energy future, or as a longer-term foundation for both domestic use and exportation. Using a worksheet, Ladlee directed Steering Committee members through a formula to demonstrate how, depending on multiple factors, there could be 3,000 or more wells drilled in the county over a period of decades. Purpose of the exercise was to emphasize the importance of preparing for change and guarding against negative impacts on the environment, infrastructure, housing and other community resources. Recognizing Potter County’s track record in water quality stewardship, Ladlee reviewed current practices in shale gas drilling and hydrofracturing. He also analyzed reports of violations and impacts on water resources. Greatest vulnerability in the drilling process, he said, lies within the first few hundred feet, where the casing passes through groundwater aquifers. A second frequent source of violation notices has been surface spills. Both of these underscore the importance of effective regulations and regulatory oversight. Also at last week’s meeting, Jason Childs presented an update on the Potter County Water Quality Work Group. Among activities is the continued maintenance and data storage from water quality monitors placed in several streams in areas where shale gas drilling is taking place or forecasted. Charlie Tuttle reported on the installation of water quality monitors on 18 separate sources servicing the public drinking water systems in Potter County. Real-time data being collected is archived for creation of a baseline and can also be accessed remotely for any sudden changes that might require immediate investigation. Terry Cole provided a summary of local and regional employment opportunities in the gas/oil industry. Helene Nawrocki discussed educational/training opportunities for those interested in employment in the field. Both Terry and Helene commented that some firms report having trouble finding employees who can meet their employment criteria in the areas of physical ability, education/training and being drug-free. Will Hunt, Jennifer Rossman and Paul Heimel gave an update on the launch of a new website, accessible at naturalgasresourcecenter.com. They will be working together to build each section of the site, with a particular focus on Resources, Business Directory, Information/Education, and Maps. PSU Extension regional administrators Melissa Sankey and Tony Siliano reported that the Penn State Extension water resources education position vacated by Jim Clark’s retirement will soon be filled and his successor will likely be able to serve on the Steering Committee. Steering Committee members agreed to resume a schedule of periodic meetings to educate the public on multiple aspects of shale gas development and its potential impact on Potter County. The public education process will also include continued publication of the Shale Gas Roundup newsletter, periodic updates to those who have opted in for the NGRC email mass-mailing list, and more frequent updating of the Natural Gas Resource Center website. Members of the Potter County Water Quality Work Group held their bimonthly meeting in the Gunzburger Building this week with a crowded agenda chock-full of developments involving water resources across the county. Bob Volkmar of Roulette presented a troubling report on water quality testing taking place this summer and fall on 10 tributaries of Oswayo Creek. Samples from Horse Run, Honeoye Creek, Raub Run and Oswayo Creek itself near the state border in Ceres, showed elevated levels of strontium, sodium, bromide and chloride. 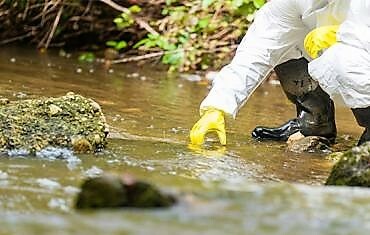 Volkmar, an officer with Trout Unlimited and the Upper Allegheny Watershed Assn., speculated that the contaminants could stem from oil or gas drilling that might date back several decades. Use of pesticides and other farming practices could be also be a cause, or there could be multiple legacy trash dumps across the region, Volkmar noted. He said the streams will continue to be tested to create an expanded database. In the meantime, Justin Boatwright, waterways conservation officer with the Pa. Fish & Boat Commission, said he would investigate the Raub Run area in McKean County in an effort to determine the source of extremely high chloride readings. Volkmar, who is active with Trout Unlimited and the Upper Allegheny Watershed Association, said the Oswayo Creek headwaters study is part of the multi-year Pennsylvania 3 Rivers Quest water quality assessment project. Sampling is taking place in the Allegheny, Monongahela and Ohio river systems to create profiles of water chemistry, flow information, total dissolved solids and other parameters that measure the health of three river basins. An earlier 3 Rivers Quest study was conducted in the upper Allegheny River water basin and results showed consistently high water quality. Members heard an update on the groundwater study being conducted across Potter County by the U.S. Geological Survey. A state grant is covering the bulk of expenses for the investigation that will provide data on the quality and constituents of the county’s groundwater, its movement patterns and other characteristics. The information will be invaluable for public policy-makers, industries, regulatory agencies and others seeking to protect water when sites are chosen for certain types of development. Testing of 47 water wells in strategic locations will soon be completed. USGS will analyze the results over the next several months. Data will be assembled and analyzed in a cumulative fashion, with the identity of individual well owners protected. Confidential findings from the analysis will be provided to each owner. Groundwater can contain a variety of suspended and dissolved substances such as bacteria, minerals and gases. These substances are often naturally occurring, but can also be influenced by activities occurring on the land surface. Charlie Tuttle, chair of the Triple Divide Watershed Coalition (TDWC), updated the work group on installation of 24/7 monitors on the supplies of nearly every public drinking water source in Potter County. Funding was obtained through the state’s settlement with JKLM Energy following a 2015 shale gas drilling infraction and pollution incident in Potter County. Water Quality Work Group Chairman Jason Childs and Jared Dickerson, both from the Potter County Conservation District, discussed multiple habitat improvement, aquatic organism passage/stream connectivity, dirt and gravel road stabilization, and agricultural assistance projects the district is working on this year. Construction of a bottomless culvert on Gravel Lick Run, a tributary of Kettle Creek, is expected to greatly improve trout migration and improve the fishery. Total project cost is approximately $200,000. Trout Unlimited, Potter County Conservation District and the Pa. Fish and Boat Commission are providing funds. A similar project is slated for Ludington Run, a tributary to the Genesee River, in partnership with the Genesee Headwaters Watershed Assn. Jared Dickerson updated members on ongoing efforts to battle the hemlock wooly adelgid, which is taking a toll on hemlock stands in the Pine Creek valley. The infestation is expected to have a major negative impact of fish and other wildlife. It will be the subject of a Pine Creek Headwaters Summit scheduled for Wednesday, Aug. 23, in Asaph. Potter County Planning/GIS Director Will Hunt and Jason Childs reported on a series of meetings held with townships and borough officials to strengthen county/municipal partnerships. They’ve conferred with supervisors, council members and secretaries to assist them with ordinances, community planning, conservation projects and other municipal business. Invasive plants continue to spread across many river corridors in Potter County. Upper Allegheny Watershed Association has been cutting and spraying Japanese knotweed infestations that are choking out native plants in the Sweden Valley area. Eradication work is also planned in the Genesee area. Nikki Ryan, coordinator for the Sinnemahoning Invasive Plant Management Area, is working to adopt two other management areas in the Genesee and Allegheny watersheds to combat invasive plants. A National Science Foundation program to obtain input on regulations and land management issues is underway in Potter County. Jason Childs, Bob Volkmar, and Penn State Extension agronomy educator Nicole Carutis are spearheading the local engagement. Similar programs have been launched in Mifflin County, Pa., as well as agricultural communities in Arizona and Nebraska. Potter County Conservation District is supporting the Pennsylvania Environmental Council’s ongoing clean-up of illegal dumping sites. Next work session is planned for Oct. 31 off Burleson Avenue in Roulette. Will Hunt reported that a study of the failing Galeton Borough dam on the West Branch of Pine Creek and options for repair or removal has been expanded. An Appalachian Regional Commission grant will pay for a more detailed analysis of recreational options, such as a boat launch, water course for canoes, kayaks or rafts, and trails to Lyman Run State Park and/or Watrous in Tioga County. Conservation Districts in Potter and McKean counties are discussing development of additional canoe/kayak boat launch areas to boost the recreational appeal of the Allegheny River. More information on the Water Quality Work Group is available from Jason Childs at 814-320-4012. Next public meeting is scheduled for 8 am Monday, Oct. 16, in the Gunzburger Building. Happy 100th Birthday To Everett Saulter! 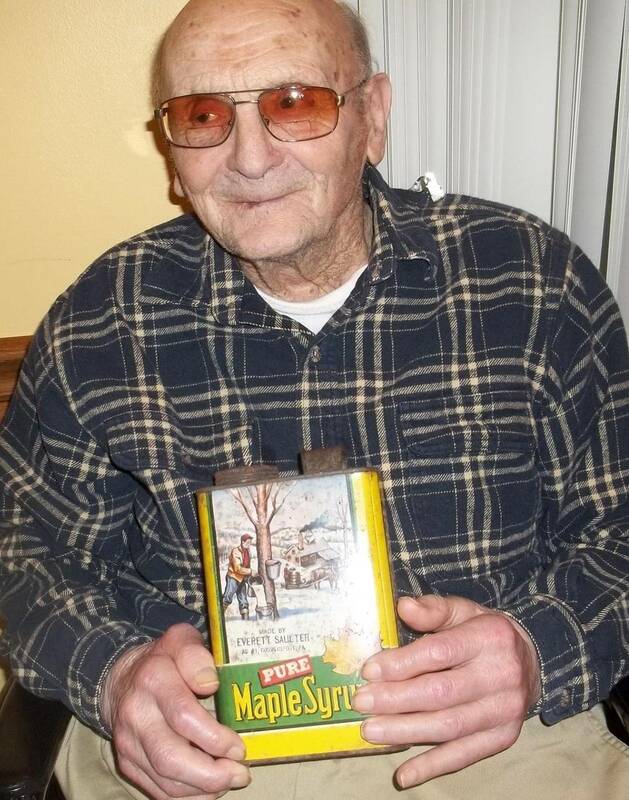 Friends presented Everett Saulter with a can that was used when he produced and sold maple syrup from his Hebron Township property. A special man whose gift to the people of Potter County keeps on giving was honored on his 100th birthday recently at Sweden Valley Manor. More than 18 years have passed since Everett Saulter donated to the people of Potter County what is now known as Saulter Forest Preserve. Groups and families use the pavilion and grounds for reunions, meetings, picnics or casual nature walks. It is located off Rt. 44 between Coudersport and Coneville in Hebron Township. The 57-acre preserve includes trails with interpretive signs, indoor and outdoor gathering areas, and a rich diversity of trees and other vegetation preferred by deer, birds and other species. A timber appraisal on the acreage came in at roughly $1 million and the land itself has considerable value. But Everett Saulter wasn’t interested in selling. The long-time Potter County resident wanted to leave a lasting gift that would accommodate recreation and social gatherings, and provide wildlife habitat and nature education. He accomplished all of that and more. For many years after he transferred the property, Everett would walk the woodlot and trail system to maintain it and guide visitors on a tour. He takes pride in the fact that more groups and families are using the preserve. Trees include native white pine, cherry, red oak, maple and other varieties of hardwoods. There is also a three-acre clearing on the southeastern side of the tract that protects headwaters of the South Branch of Oswayo Creek. The County Commissioners have assigned the county maintenance crew to care for the property and Potter County Conservation District continues its active involvement.